Join us at Book Culture on 112th as Dan Wakin discusses The Man with the Sawed-Off Leg and Other Tales of a New York City Block on Tuesday, February 27th at 7pm! Dan will be joined in conversation by Michael Kimmelman, architecture critic for The New York Times. They stand proudly gazing across the Hudson River at the cliffs of New Jersey. Their brows are marked by ornamental pediments. Greek columns stand as sentries by their entrances and stone medallions bedeck their chests. They are seven graceful relics of Beaux Arts New York, townhouses built more than 100 years ago for a new class of industrialists, actors and scientists -- many from abroad -- who made their fortunes in the United States and shaped the lives of Americans. If only the walls could talk? Daniel Wakin makes it so in this unforgettable intimate glimpse into the history of New York City. Dan Wakin has been an editor and reporter at The New York Times since 2000. He currently is the deputy editorial director of NYT Global, a team established in 2016 to increase the international audience of The New York Times. Previously, he was a deputy editor in the Culture Department, with responsibility for the daily Arts section and international cultural coverage. As a reporter for the Times, his beats included religion, classical music and dance, and general assignment in the Metro department. He has covered stories in more than a dozen countries in Asia, the Middle East, Europe and Latin America, including the election of two popes. He also took part in the group that produced the Emmy-nominated multimedia project Inside the Quartet. A graduate of Harvard University with a degree in the Classics, Mr. Wakin continues to be an avid amateur clarinetist. 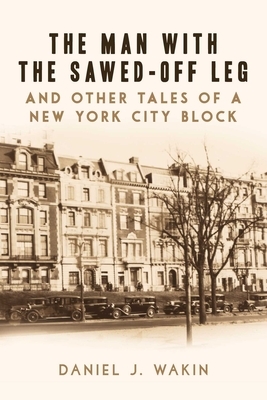 The Man with the Sawed-Off Leg and Other Tales of a New York City Block is his first book. Michael Kimmelman is an author, critic, columnist and pianist. He is the architecture critic for The New York Times and has written about public housing, public space, climate change, community development, infrastructure, urban design, landscape design and social responsibility.